Discussion in 'Buying Tips and Advice' started by shelbyone, Mar 6, 2013.
hi there...time to upgrade....where to buy the Seagate Solid State Hybrid ST1000LM014 1TB 64MB Cache 2.5" SATA Drive for less than $149? the actual price should be $99....anyone??? Seems like list price is $149 where are you getting $99 from? Another online stores have it out of stock or 20-35 USD over this price. They're very overpriced considering they have an anaemic 8Gb of SSD cache. It's going to be even worse with the 1Tb drive too because the HDD part only uses a 5400rpm mechanism unlike the smaller drives. There's no benchmarks out for them yet but you can bet they stack up even worse than the smaller capacity models and end up bested by any current SSD on the market. Fusion drives use 128Gb of cache, to put this in perspective, the clone of my boot drive is just over 30Gb because I backup the documents and iTunes folder to another drive. That means the OS, 3rd party applications and related support files wouldn't fit in 8Gb and I can't see that being drastically different for any other Mac OS X installation give or take a Gb or so. Here's a graph showing how slow any drive using SSD becomes once that cache runs out (Which it will quickly with only 8Gb). 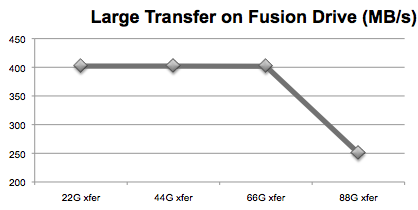 Those are supposed to be MSRP, the new models are 5400RPM, so you can safely skip that and build a Fusion Drive.